Will Button and Villeneuve bring success to BAR? 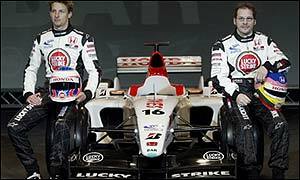 Jenson Button proved there is no love lost between the new BAR team-mates when he responded strongly to criticism from Jacques Villeneuve. Former world champion Villeneuve made it clear at the launch of the new BAR 005 car that the Briton would have to improve before he makes an impression as a driver. "I will respect Jenson once he goes quick on a race track," said the Canadian. "That's the only way you can respect another race car driver." But Button hit back by claiming he has nothing to prove to Villeneuve. "I am not here to earn Jacques' respect," said the Englishman. "I am here to win and move the team forward. "We are not going to move the team forward if we start getting petty and arguing about things. "When we are winning, then it's fair enough. Then we are going to be very competitive team-mates. "You don't need to be best friends with your team-mate or laugh at each other's jokes. "You just need to work together and not keep secrets from each other." Villeneuve, world champion in 1997, has a reputation as a difficult team-mate, and went on to claim that Button is little more than a marketing tool for the team at present. "The team prefers to use him for that kind of stuff but the team prefer me for the in-car activity which is racing hard," said Villeneuve. "He (Button) brings to the sport what the boy bands bring to music. He is young and cute which is not bad, I guess, for the girls. "If you do respect him like it was the case with Olivier Panis last year then everything works fine and no-one gets destroyed. "But if you do not respect your team-mate then it just happens, you can't help yourself." Both men face a year that will be crucial for their careers. But the Canadian insisted that Button is the driver under pressure this year. "He comes into the team perceived as being a future world champion so I guess there is a lot on his shoulders," said Villeneuve. "I have already won races in the past, I know what I can do and people know what I can do." Links to more Formula One stories are at the foot of the page.